WalmartWalmart bars customers from buying more than 32 items in a single order. Walmart bars customers from buying more than 32 items in a single online order. The company declined to comment on the reason for the limit. Amazon‘s per-order limit is 50 items. The company did not immediately return Business Insider’s request for comment. Eileen Phillips was shopping on Walmart.com on Thursday for items like laundry detergent and toilet paper when suddenly the retailer cut her off from adding anything more to her basket. Phillips was frustrated. She said she would have bought more items if Walmart hadn’t cut her off. Phillips isn’t the only customer who has encountered this issue. We found several complaints on social media dating back to 2015. Business Insider also tested the system, and received the same message prohibiting more than 32 items in an online cart. Most customers likely aren’t shopping for as many as 32 unique items. (The limit only applies to unique items – meaning Phillips could buy 33 bottles of the same type of lotion, but she would be barred from buying 33 different types of lotion – and it doesn’t apply to groceries). Regardless, Walmart lost money on Phillips’ order, and it could be losing money on many other orders due to the limit. The company declined to comment on why the limit exists. 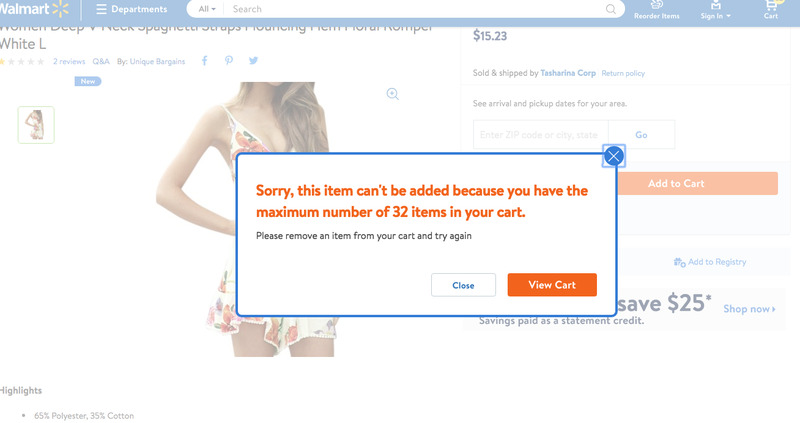 But Walmart isn’t the only website with a shopping-cart limit:Amazon also bars customers from buying too many items. The e-commerce giant has a higher threshold than Walmart and prevents customers from adding more than 50 items to a single order. An Amazon representative did not immediately return Business Insider’s request for comment.